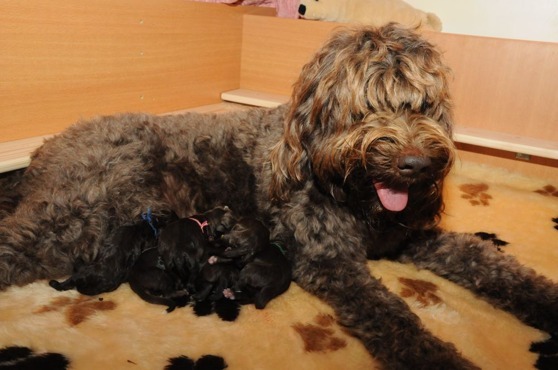 On September 18 2015 Moët gave birth to 7 puppies, all brown with white markings. There are 4 males and 3 females. The proud father is Claude (Netis Hazzah) in Wales. 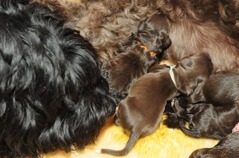 You can follow the development of the puppies on the blog. We named this the Miracle Litter because of the miraculous outcome of the traffic accident Moët and I were involved in after the second and final mating with Claude. You can read the amazing story in this blog post. The birth went unexpectedly quickly, in less than 4 hours all were born. 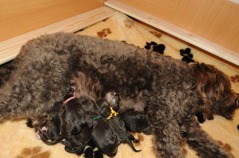 For Yatzie the labour lasted 12 hours for both her litters. All the puppies have white on all their feet! From just a little to half a sock. All have a white breast, smaller and larger areas, and some very long or irregular. And two have a white tip on their tail - so cute! All the Miracle puppies already have loving families eagerly waiting for them. Grandma Yatzie is helping in the whelping box!